Excuse me for the lack of posts of late. I’ve been in bed for much of the past 48 hours — minus a trip to the ahhh-some HealthPartners West Clinic urgent care in SLP. While being sick is awful. And I can’t remember the last time I felt this bad for this long (I don’t feel out of the woods yet), it has allowed me to watch a lot of television and sports on television. 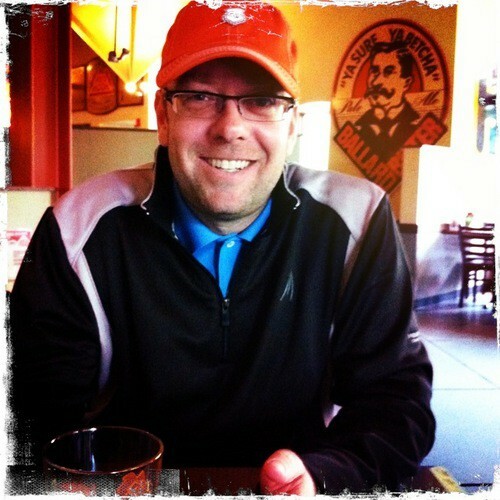 – I didn’t think this would happen, but after watching the Gophers on TV on Saturday afternoon and Long Beach State on Saturday evening, the former Gophers coach had his team a whole lot better prepared and a whole lot more organized than the current Gophers coach. – What was that thing Martin Kaymer was wearing around his neck today at the Match Play? It was a bad look. But as someone who picked Kaymer in my one-and-done fantasy golf league, I don’t care what he wears as long as he keeps winning. If he wins tomorrow, I think I move back into first place. If not, I’m very close. It has been a good week. – Watched the ESPN 30 for 30 on Paul Westhead and Loyola Marymount. It is worth a watch. It isn’t as good as the Vlade Divac Once Brothers film, but it is good. – Yes, The Jimmer is very good. And Pete Thamel\’s read on the BYU guard is a worth your time. – You are going to hear much in the next couple of weeks that Virginia Tech is in the NCAA tournament after beating Duke on Saturday night. I’m not quite so convinced. That win gives them exactly one top 50 RPI victory. I think they have a chance, but when you have two fewer top 50 RPI wins than the Gopher, you better win a couple of more games. – I officially care zero about the NFL Combine. I would rather watch girls high school hockey. That’s it for tonight. I’m out. Maybe this is fairly obvious. But beer is big business. Interesting New York Times story about MillerCoors dropping $400 million for a NHL sponsorship. The deal is reportedly more than double what Anheuser-Busch in the U.S. and Labatts in Canada are spending this season. So there you go, a random item on a Tuesday morning. Please read this post from my guy Wegobomber on Saturday\’s dunk contest. I don’t have a whole lot to add to it other than I agree with a lot of it. If you roll though my past ramblings here on this tiny little spot of the internet, you’ll see that I like Blake Griffin. Quite a bit actually. But I’m not certain he deserved to win the dunk contest. I’m not sure he deserved to get out of the first round. Not with a pretty pedestrian (by dunk contest standards) second dunk. Not when compared with what DeRozen did. I’m not going to like, I agree with it. The NBA needed Blake in the finals and needed him to win. The car was there, the event was in Los Angeles. It smells just a little too fishy for me. 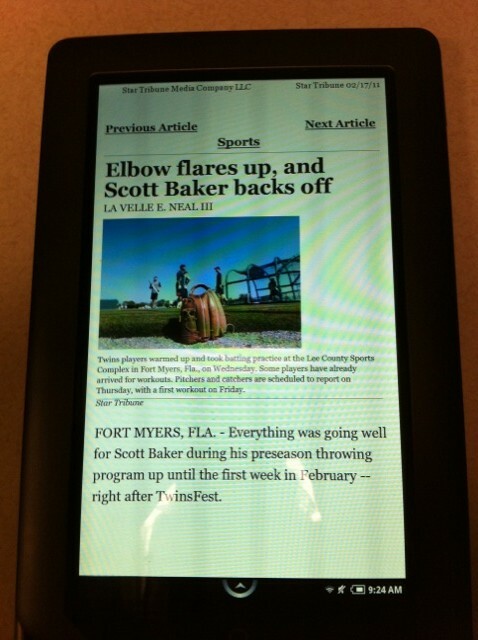 Yesterday, I blogged about reading newspapers on my Nook Color. Since then, I received a couple of questions: Why Nook instead of Kindle? And why not get an iPad because it can do more? I’ll tackle the Kindle question first. I went with the Barnes & Noble Nook Color for one primary reason: Library books for free. I purchased my initial Nook (the original with the black and white screen) back in the fall. Shortly after the Nook Color was announced and came out. Fortunately for me, I didn’t have the Nook for long and B&N allowed me to return it for full credit and pay the difference for the Nook Color. While I use it for newspaper reading, I’m also doing more reading overall. Unlike the Kindle, you can checkout e-books from the library for free. The Hennepin County Library has a good selection and in the four months I’ve had the e-reader, I’ve probably read about 10 books for free. Many have been books I may or may not have purchased otherwise. With a library book, if you don’t like it, you just check it back in. It’s not a big deal. With my library, e-books can be checked out for 21 days at a time. Why not an iPad? The biggest reason, honestly, was that I didn’t want to spend twice as much cash. A Nook Color is $249. IPads start in the $500 range. Plus I have a laptop. A MacBook to be specific. While the iPad is super cool and it can do more than the Nook Color, the NC does have some good stuff. It has a web browser that isn’t awful. It’s reasonably quick and it works in a pinch. It would be cool to stream Netflix on an iPad and use some of the cool apps. But I wanted something that was more of a reader than a computer. I like that the Nook Color has a browser, some games and (allegedly) will be getting more things. I think it would be different if I didn’t already have a laptop. The Twins on TV: There was a front page story in the Star Tribune. There were TV stories. There was much angst on Twitter, Facebook and other parts unknown about the fact that the Twins would no longer have games on over-the-air television on a regular basis. Instead, everything will be on Fox Sports North. My opinion: Deal with it. And welcome to reality. If you didn’t realize sports was a business previously, you should have. And let’s say this forces you to sign up for television of some sort. David Brauer worked to find out how much it would cost. The cheapest option is Dish Network at about $600/year once promotions expired. Let’s say you only watched the Twins and got no other benefit from having expanded television — that means not one Jersey Shore episode or Top Chef episode and not a single highlight on SportsCenter — it averages out to be less than $4 per broadcast Twins games. And for the “we paid for your stadium crowd,” your tax dollars go to many businesses. If a major retailer gets any tax breaks in building a store, does that mean you get to go in and take stuff for free? Maybe I’m a jerk, but if it is important to you, you can pay for it. Or you can listen to the radio. Or you can hit up your friends with cable. Something I like: Melting snow. This week has been glorious. I realize we’re going to get snow on Sunday/Monday. I can’t imagine that we’re going to have another snow-free March. But this is a good start. I saw actual grass today for the first time in months. This week of melt is going to help once things really start to warm up. And with the golf show starting tomorrow at the convention center (I’ll likely make an appearance on Saturday), the timing is perfect. Something I don’t like: All of this Albert Pujols drama. We finally got LeBron settled and unpacked in South Florida, do we really need this? For the next, say, eight months, we’re going to get force fed a diet of: Will he? Won’t he? Does he want to stay in St. Louis? Will the Yankees be interested? What about the Red Sox? As someone on Twitter posted, maybe they can just trade him to Denver for Carmelo Anthony. And talk about another story I’m tired of. The Gophers: When I started blogging on a regular basis, someone said, ‘Why don’t you blog about the Gophers?’ I said, ‘Why don’t I poke out my eyes with a fork?’ But I will add simply this: The loss at Penn State wasn’t good, but it doesn’t mean the Rodents are destined for the NIT. If you hear people saying that, they don’t know enough and you shouldn’t listen to them. This Gophers team might not deserve to be a NCAA tournament team, but they still very much have a chance. They don’t really have to do that much to make it to be honest. If they get to 9-9 in the league, I think they will be fine. The tournament bubble is awful — have you seen the middle of the ACC and the SEC? Yuck — and there are four more at-large bids. Can the Gophers get to 9-9? That’s another question. This team isn’t all that good right now. They have point guard issues, they’ve gotten some bad breaks, but I also don’t think Tubby can get a pass either. This Penn State loss is a perfect example of why. The Gophers had two offensive possessions out of timeouts in the last minutes and both were disasters. The first one (with about 50 seconds left) looked like a fire drill. A team with a massive front line didn’t have a player in the paint and eventually the Gophers traveled. Later, it looked like the Gophers had a little better direction coming out of the timeout, but the ball was thrown out of bounds. And that doesn’t mention the inability to close defensively on three-point shots. Despite the breaks, the setbacks, the Gophers had a chance to win this game. It was the kind of game that an above average team should win. It doesn’t doom the Gophers, but it doesn’t help them either. I have pretty much always loved newspapers. When I was very young, I would lie on our living room floor and read the sports page in front of me. I read about the Twins more than anything. And I’m talking about the mid-70s Bombo Rivera, Lyman Bostock, Craig Cubbage Twins. My first “job” was delivering the West Central Tribune. I started on the first day of school in fourth grade. Obviously it became what I did for a living for a long time. I don’t really remember a time when I didn’t get a newspaper delivered to where I was living. When I was traveling, I was the guy who would buy multiple newspapers at every stop just to see how different papers were doing things. But now a couple of months into an experiment of not reading an actual hard-copy version of the newspaper. This past fall, I purchased a Nook Color, the nifty e-reader from Barnes & Noble. It’s really an e-reader plus, but I will get to that in a later post. I initially started getting just the New York Times delivered daily to my Nook Color. It was, and is, great. One of the best things about my previous job in higher education was that I could pick up the NYT on campus for free. I find it to be a joy to read as there are always interesting stories. I would bring it to lunch, find a table by myself and read while eating lunch. With the Nook Color, I get the benefit of getting a much later edition of the newspaper than the national edition — yes, there are actual sports scores in there — while also not being overwhelmed with unread sections of the paper piling up each day. Starting around Christmas, I added the Star Tribune to my Nook subscription list. I wasn’t sure if I would be comfortable getting my primary newspaper electronically. But I figured that since it is available for reading at work as well that I would give it a chance. The bottom line is that I really like it. I usually get through the main things I want to see in the Star Tribune before I leave the house or right when I get to the office. I mix in some of the NYT in the morning and look at more of it at lunch. There are some days when I don’t get to as much of that as I would like. Here’s a quick look at pros and cons (and some photos) of my move toward a paper-free life.